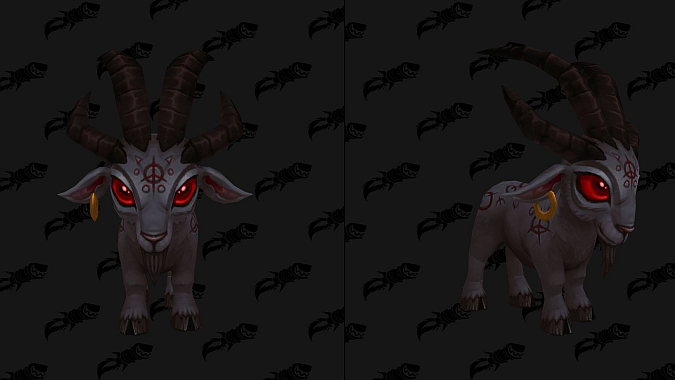 Datamined early in Battle for Azeroth development, the World of Warcraft Secrets Community Discord has uncovered the many, many, many steps to get the adorable demonic goat battle pet Baa’l. Initially they thought they were on the trail of the highly anticipated The Hivemind mount just because there were so many parts to this challenge. I won’t spell out all the pieces of the search — the good people over at Wowhead have all the waypoints and some helpful videos to help you find each teeny tiny pebble. There are 13 pebbles in all to find, quite appropriate for a demonic goat. Some go all the way back to Warlords of Draenor areas! After you find them all, the final step is to defeat Baa’l himself in a Pet Battle. The battle itself is allegedly quite difficult unless, as WarcraftPets notes, someone pulls out the Uuna pet nearby after having completed her additional story. This helps neutralize the overpowered “Murder the Innocent” ability and reduces Baa’l’s stats. The Baa’l battle pet looks to be a middling fighter, with several abilities that have long cooldowns. A combo using Curse of Doom and Nether Gate might be interesting, but in that scenario Baa’l would have to survive long enough to use it multiple times. Its large health pool could help with that but it doesn’t have any other self-sustain abilities. This pet will likely make its way onto my team for a few Family Familiar strategies, but it doesn’t look like a contender for my A-line teams. Honestly, given its lengthy acquisition process, I’m okay with it not being at the top of a must-have list for battling. Lastly, there’s bound to be some disappointment among Diablo fans. It was rumored early on that Baa’l might be a tie-in for some upcoming project for the franchise some might say is a bit neglected. With the demonic name and color palette on a little goat it does make sense, but it’s not meant to be this time around. Luckily there are more things to look forward to in the months to come!